Both have courage and both make an impact on people’s lives. A U.S. soldier fights for our freedom. He or she pushes through the fear and puts his or her life on the line to give us our freedom. We can all agree that we are very thankful to every U.S. soldier who has put their lives on the line and those who have given their lives for us. It takes a lot of courage to move past that fear and commit to a life of serving our country. Then there is the courage it takes for someone who is a public figure, who had won the gold medal in the 1976 Summer Olympics and set a world record in the decathlon, to announce to the world that he is transgender. She too, is impacting people’s lives. Albeit, in a different way than a soldier and why I say that courage comes in different forms. Her courage has hopefully opened the doors for others to be able to live the life they want to live. I am positive that her courage changed the lives for many people. I applaud both and I thank both. Since my time on Survivor I have been flooded with messages both online and in person, that I had courage. Courage to go on national TV and to play the game I have loved for 15 years. 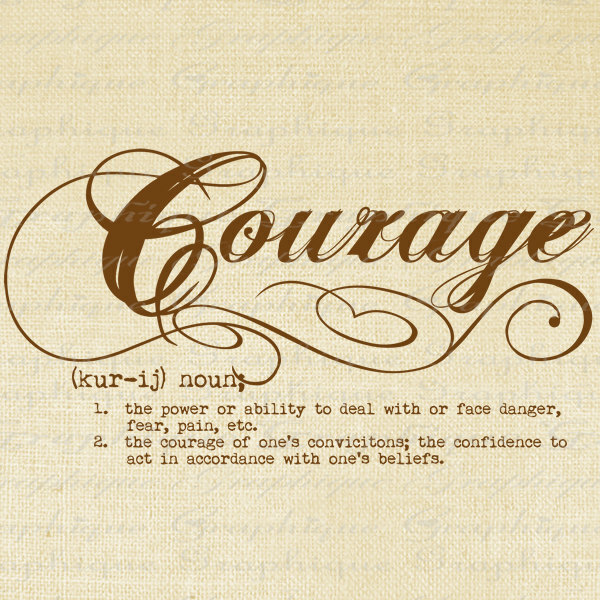 Courage because I am deaf. I never thought of myself as having the courage to put myself out there. But I guess, in a sense, it was courage, if I look at it the way I describe courage, the strength to push past fear. That’s what I did, I pushed past the fear I had, putting myself into a situation that I knew required some stealth hearing. Yes, I had cochlear implants and I knew I would be able to hear. But I never thought that it would hinder my ability to play the game. What I didn’t know was that it would impact others with hearing loss, I didn’t know that people with hearing loss were letting it hold themselves back from what they wanted to do. So I guess I did have courage. Do I deserve an award for what I did? No, but I think I gave people hope and courage to do the things they want. Do soldiers deserve awards? Absolutely! And those that deserve them do receive them. There are the Medal of Honor, the Distinguished Service Cross, the Navy Cross, the Air Force Cross and the Silver Star. Did Caitlyn Jenner deserve the Arthur Ashe Courage Award? I believe she did and I know others believe she did not, but ESPN thought she deserved it and since it’s their award to give, then who are we to criticize. When I think about courage and how I perceive courage, I believe that we all have some form of courage and that we use that courage to help us do the things that we want to do. Well said Nina….. 😉 Courage comes in many forms….